MicroBrute by Arturia is . MicroBrute Analog Synthesizer is a compact, semi-modular analogue monosynth with built-in step sequencer, MIDI, USB, and CV connectivity, and a number of other unique features. Steiner-Parker Multimode Filter (LP, BP, HP). Voltage Controlled Oscillator with new Overtone Sub-Osc. Oscillator Mixer (Sub, Sawtooth, Square, Triangle). LFO with 3 waveforms and destination attenuator. External Analog Audio Input (level pot on rear). CV outputs: Pitch, Gate, Env, LFO. MIDI In with 5-Pin DIN connector. 1/4" Audio Output and 1/8" Headphone Output. 8 sequences stored on power down. Multiple modes (via software editor). Like its big brother, the MicroBrute features an OSCILLATOR that has SAW, TRIANGLE, and SQUARE waveforms that are all mixable to help shape the resulting sound. Additionally, the new Overtone oscillator generates additional harmonic content, ranging from one octave down to a fifth above the base OSCILLATOR pitch, while the Sub > Fifth control can continuously sweep spectrum. Moreover, Metalizer adds complex harmonics to the TRIANGLE waveform for creating harsh, harmonically-rich sounds, while Ultrasaw adds a lively and bright ensemble effect to the SAWTOOTH waveform — perfect for crafting sounds suited to dance anthems. There is a Pulse Width control for creating nasal-thin tones or rich square sounds. MicroBrute's distinctive-sounding Steiner-Parker FILTER plays a big part in helping give the MicroBrute a unique sound — again, just like its big brother. This filter design dates back to the Steiner-Parker Synthacon, an analogue monosynth built by the namesake Salt Lake City-based synth manufacturer between 1975 and 1979. Its HP (high-pass), BP (bandpass), and LP (lowpass) modes make for far more filtering flexibility than that found in synths many times the price. Arturia's acclaimed Brute Factor adds anything from subtle overdrive to full-blown intermodulation havoc. The easily accessible, front-panel mounted MOD MATRIX is a Volt per Octave-standard patchable system of modulation routing with ENV (envelope) out, LFO (low frequency oscillator) out, Ultrasaw modulator in, PWM (pulse width modulation) in, Metal (Metalizer) in, Overtone/Sub modulator in, Filter cutoff in, and Pitch in — meaning more in-depth, inbuilt sound-sculpting possibilities, as well as allowing Arturia's own MicroBrute to be brought into the interfacing mix, or mixing and matching with third-party modular synth systems for far-out sonic explorations. The new eight-Pattern step SEQUENCER is designed to be a source of inspiration and rhythmic creativity — step input notes and rests to create storable sequences that can be played back and switched between on the fly at a variable Rate or synchronized to external MIDI clock. Meanwhile, MIDI, USB, and CV GATE connectivity, of course, combine to ensure that the MicroBrute is ready and willing to talk to the outside electronic musical instrument world wherever it may find itself. It's even blessed with an external audio Input with Input Level control, so why not use it to process whatever you feel like sticking into its 1/4-inch socket — within reason, of course. 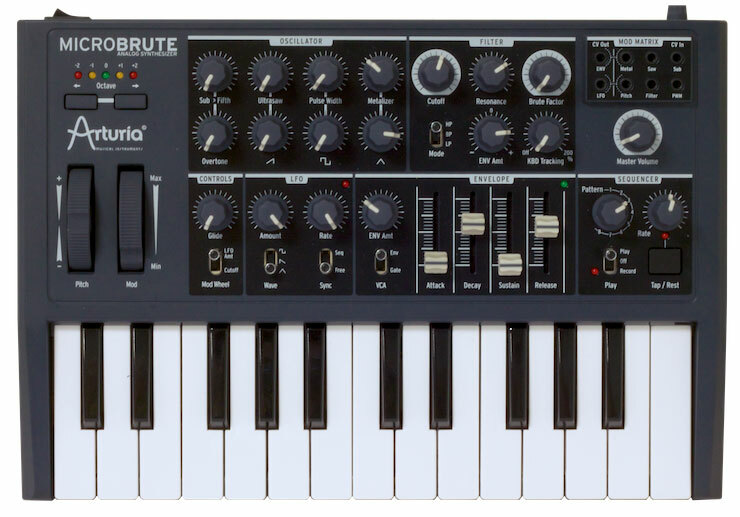 With a space-saving 25-note mini-keyboard and weighing in at only 1.75kg, the MicroBrute Analog Synthesizer is truly compact and bijou, but punches well above its weight with a rip-roaring analogue sound spanning woofer-flapping bass, screaming leads, ear-opening effects, wave-folded growls, punchy drum sounds galore, and much in-between and beyond. Pick one up from an authorized Arturia dealer today.